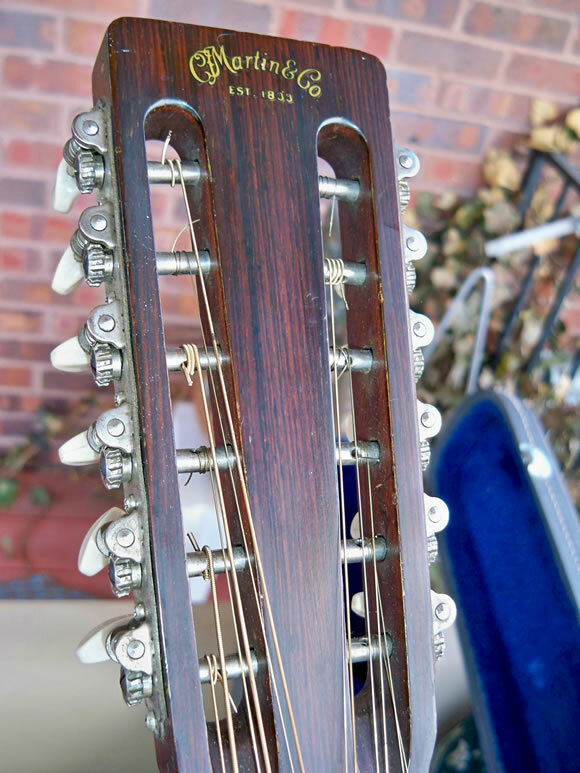 Sweet playing and sounding, my nicest 12 I've owned; big sound, and plays amazing easily, even tuned to full-pitch (you can bend the strings); it stays in tune! Slotted peghead; brazilian RW fingerboard and bridge; tortoise PG; and black binding; style 28 checkered backstripe; only crack is a little PG crack, and that was pro repaired, along with a setup, a few years ago; some players wear around soundhole and a filled ding on lower bout, but quite clean (VG+/EX overall); nice mahogany and good spruce; comes in what appears to be original correct era case (blue interior, grey exterior with purple ribbon). You can inquire, but I might not sell it, because it is one of my players!! And very under-valued IMO.